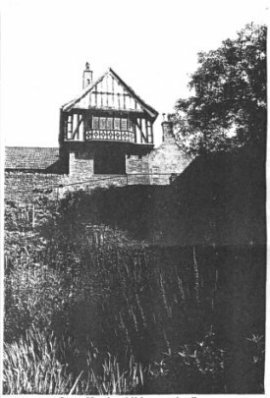 The manor of How Caple goes back to Domesday times and from the 17th to the 19th centuries was the home of the Gregorys, a noted family of lawyers and parliamentarians. However the charming grouping we see today of the Court, its gardens and the church is in its modern form essentially the creation of one man, Lennox Bertram Lee. He was born in 1865 into a family of Lancashire textile manufacturers. The firm of Tootals we are familiar with in recent times was formerly Tootal, Fowler and Lee. Following in the footsteps of a number of Northern textile barons who bought property in Herefordshire in the late 19th century, he acquired the How Caple Estate in 1898. He seems to have been imbued with the spirit of the Arts and Crafts movement which was in its heyday at that time, and its influence can be seen today at the Court, the gardens and within the church. The house Lee bought was basically the late 17th century house of the Gregorys. From 1902 up to the Second World War he added to the house and its outbuildings, including a new west range, a gatehouse and numerous ancillary buildings. These are mostly in the English vernacular style with plentiful timber framing. In the spirit of the Arts and Crafts movement craftsmanship was encouraged and direct labour was used, including the employment of Ursells of Ross for carved stonework. The garden Lee took over already had its 17th century terraces stepping down towards the Wye and an enormous Victorian rockery plunging 40 feet down a steep slope. He was a noted amateur garden designer - he is even said to have assisted the King of Romania with the design of the royal gardens in Bucharest - and he made many additions at How Caple. These include an Arts and Crafts gazebo, a Japanese-inspired gateway, a tennis court with a rustic pavilion and a circular reflecting pool surrounded by a pergola of roses. His biggest garden project was the Florentine garden. This was in a formal style with paved areas, a loggia, clipped yew standards, statuary on pedestals and cross-shaped water channels. The water runs down over cascades to a rill stretching down to the end of the garden, where it ends at a pillar with a stone pineapple on top. After L.B.Lee's death the gardens fell into decline, but were restored by his grandson, Peter Lee, who himself sadly died a few years ago. The restoration is only partial so that the gardens (open to the public in summer) retain a poignant air of faded grandeur. L.B.Lee also made his mark on the interior of the church, acquiring two panels from a South German altar piece of the 16th century and commissioning a new carved reredos. 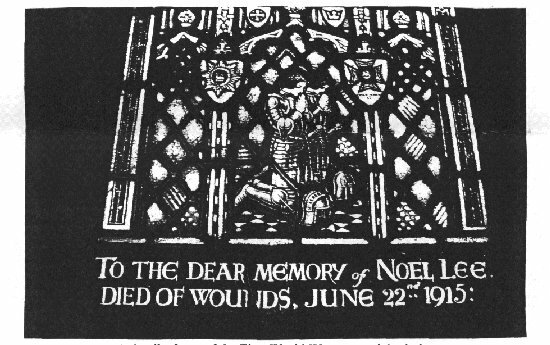 However, his main contribution was the excellent stained glass he introduced throughout the church, using the services of the Bromsgrove Guild. These were the chief exponents in the West Midlands of Arts and Crafts craftsmanship, working in a variety of materials. Their work includes the ornately decorated wrought iron gates outside Buckingham Palace. 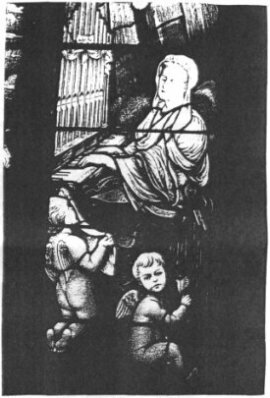 There are sombre windows in memory of Lee's son and other family members killed in the First World War and brighter windows largely in blue tones, for instance one depicting his mother playing the organ. He even had the north porch demolished and the north wall of the nave rebuilt so that two extra stained glass windows could be accommodated. Among his many benefactions to Hereford Cathedral were the stained glass and carved reredos in the Stanbury Chapel, both by the Bromsgrove Guild. Why was he so keen on stained glass? A plausible (although totally unsubstantiated) explanation is that it was to atone for an act of family vandalism. In the Lady Chapel of Gloucester Cathedral there is a beautiful series of windows by the leading Arts and Crafts designer, Christopher Whall. These extend along both sides of the chapel except for one corner, where there is a memorial window of 1898 to Lee's father. The writer of the history of Gloucester Cathedral calls it "an appalling example of late Victorian trade glass". He states that the features of the Gospel figures in the window are from photographs of the Lee family and adds "what possible justification could be found for allowing an album of family photographs to adorn a lady chapel it is hard to imagine". Was some feeling of shame for this perhaps a reason for L.B.Lee commissioning good Arts and Crafts glass at How Caple? 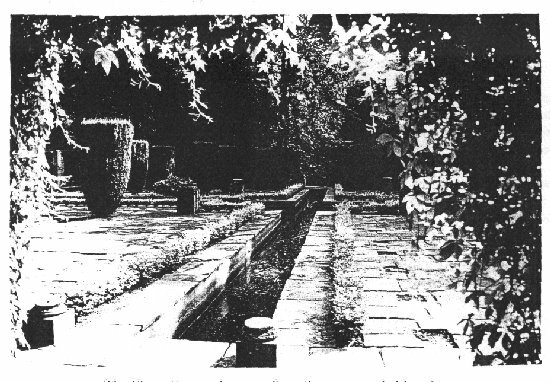 Lennox Bertram Lee died in 1949 and lies in How Caple churchyard adjacent to the Court, its gardens and the church, whose present day appearance he did so much to create.